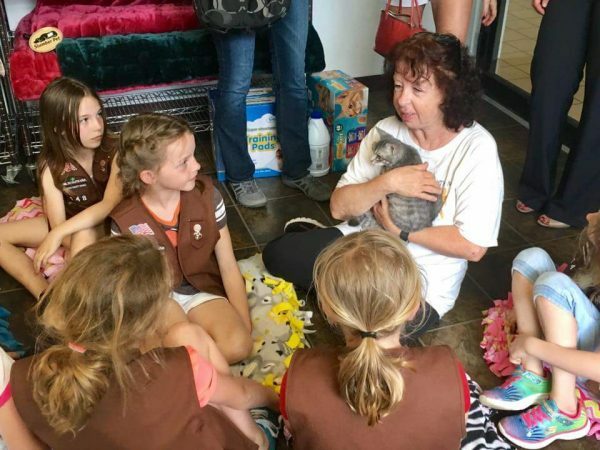 There are many reasons why you should schedule the Friendship Animal Protective League to visit your school or summer camp. The Friendship APL mission is to ensure that people and animals are treated with dignity, kindness and respect – a valuable lesson for our youth to carry with them into their everyday lives. Exposing children of all ages to animals has a long list of advantages. Various studies agree that when children are raised with animals, they benefit from increased levels of empathy, are more kind, have a better grasp of caring for other living things, are more responsible and even perform better in school. Many animal rescues charge a fee for off site visits – we do not. However, we appreciate any donations from our wish list. We are always in most need of cat and dog food and litter, but we also can use used towels and blankets. Some groups even make us toys and treats for the animals. It benefits our mission greatly, and it’s a great way to get kids involved and feeling like they’re making a difference. Bringing an animal into the classroom is an engaging, hands-on way to teach valuable lessons. Some of our animals are victims of neglect interacting with these animals is an important lesson in bullying and teaching others how we want to be treated.